Microblading, also referred to as Eyebrow Embroidery, Feather Stroke Brows, 3D Brows, or micro-pigmentation, is the process of manually implanting color pigment beneath the surface of the skin by means of tiny, sterile, disposable needles to produce the appearance of hair strokes, makeup, and to naturally enhance features of the face. 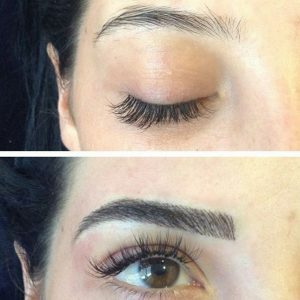 + What is the difference between microblading and standard body tattooing? The purpose of microblading is to enhance the features with what appears to be undetected, natural looking eyebrows. Microblading is more subtle – it is meant to be a natural-looking enhancement. Traditional body tattoos use electric tools and ink while microblading procedures involve pigments and an manual hand tool. + Who is microblading for? If you want to effortlessly look your best anytime, then microblading is for you! If you want to look younger healthier, and more vibrant permanent makeup does wonders! If you’re a busy mom, business woman or have an active lifestyle you’ll save hours every week not having to stand in front of the mirror slaving over applying makeup. Not to mention, you won’t have to worry about sweating it off during a workout or melting by the end of an evening out. + Do my existing eyebrows need to be shaved off? Most definitely not! Please do not tweeze, thread, wax or modify your eyebrows in any way for as long as possible, and no sooner than two weeks. The beginning of your service includes a brief consultation, followed by shaping and finally a discussion about color. 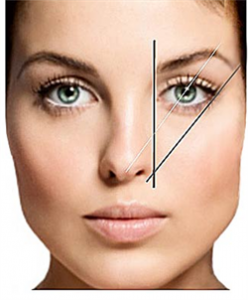 Your regular brow maintenance of tweezing, threading, waxing and/or tinting may continue once the brows have healed. Everyone has a different level of sensitivity. An anesthetic is applied for numbing during the procedure to alleviate discomfort. Every effort is made to ensure you remain comfortable for the duration of the procedure. Clients are usually pleased to discover that it is no more painful than having your eyebrows tweezed or threaded. * If you are a frequent smoker, the topical anesthetics used during the treatment will not last as long. + How long is the healing process? It is normal to experience minimal swelling and tenderness following your procedure. It doesn’t take very long for it to disappear. Immediately following your treatment the pigment will appear darker than how it will appear once it has healed. Around week 2, the surface color naturally exfoliates to leave a softer color. During week 3 & 4 when the skin completes healing, you will see the pigment darken a bit. A Touch-Up visit approximately 6-8 weeks after your initial appointment is necessary in order to achieve that richness of color and density in the shape. + How old do I have to be to get tattooed? You must be 18 years or older to receive Microblading at EvelineCharles. + Can I get tattooed if I am pregnant or nursing? + How long does microblading last? Microblading is a cosmetic tattoo which typically lasts 12-18 months. The pigment will fade over time and we recommend to get a touch up annually to keep them looking their best.. There is no guarantee in how long it lasts as each individuals skin will respond differently. Frequency of touch-ups depends on a number of factors including: skin type, pigment selection, lifestyle (sun exposure), iron deficiency (your body absorbs iron-oxide as a supplement), chemical peels, etc. For microblading, at least two appointments are needed initially, at least 6-8 weeks apart. At the second treatment, we will assess the color retention and make adjustments as necessary. Everyone heals differently and at different rates. If your cosmetic tattoo does not heal perfectly the first time, do not worry! We can always go bolder and add more density at your next appointment. + What factors will affect microblading? Sun exposure: The sun will extremely soften the look of your tattoo, so a physical sunscreen should be used (once healed) to prolong your enhancement. Bleeding during the procedure: Any bleeding during the tattooing procedure will reduce the amount of pigment absorption. Caffeine, alcohol, and certain medications act as blood-thinners and should avoided 24 hours prior to your appointment. + What should I do before my eyebrow procedure? It is highly recommended that you avoid sun exposure for 30 days after your procedure. + How will I look immediately after? Your brows will appear darker and more intense than expected for the first week or so. This will gradually lighten during the complete healing process. Redness and swelling is minimal. Please view our detailed Before & Aftercare Instructions. + What should I do after the procedure? Please review our detailed Pre & Post Care Instructions. It is highly beneficial to follow these instructions to ensure a comfortable healing process and to achieve the best possible results. DO NOT rub or pick the healing area as the color will peel off prematurely, and avoid extreme heat, sweating, and contaminated bodies of water (such as saunas, hot tubs, steam rooms, pools, lakes, and places with hot humidity, etc.). + How will my microblading brows look in the future? During your appointment, we will analyze your skin tone to anticipate how pigment colors will heal and fade in the future. We will also mix pigments to ensure the color blends well with your natural hair and skin color. There are some cases, however, where the color may fade to different tones according to the individual’s response to the pigments (like lifestyle and iron deficiencies). Many factors affect these changes. At your follow up appointment, we will re-analyze how your body has responded to the initial color. If needed, special formula alterations to correct the color is made at this time. Your eyebrow tattoo will eventually look softer and have more of a “powdered” look. To keep your brows looking their best, a refresher appointment is suggested every 12 months. Results and preferences vary with each client. + What should I know about long term care? The color will lighten over time. We recommend an annual touch up to keep brows looking their best. Fading greatly depends on your skin type, lifestyle, sun exposure, pigment color used, broken capillaries, iron deficiency, and if any chemical peels were done after your procedure. Go ahead and give us a call today to schedule your appointment, and say hello to your most beautiful brows yet! Microblading is now available at all of our locations in Edmonton and Calgary! Do you have a promo price? Thank you for getting in touch with EvelineCharles. Our microblading prices start at $450 at our West Edmonton Mall, South Edmonton Common, Southcentre Mall and CORE locations. Please call 780- 424-5666 or 403-571-5666 to book your initial consultation! Do you still have the $450 promo for the Microblading? I am interested in booking a consultation for microblading. Are you still running your promotional pricing? How much experience does the team at the CORE location have with Microblading? The team at CORE have over two years of experience in Microblading! Call 4035715666 to book in your consultation today! Hi Danielle, do you have this promotional price in Edmonton as well? This pricing is only in Calgary at the moment, but we will soon have it in Edmonton! Thank you for getting in touch with EvelineCharles. Our microblading prices are $450+ at our West Edmonton Mall, South Edmonton Common, Southcentre Mall and CORE locations. Is this service available in Edmonton? Can I use Eveline Charles Gift Certificates? Thank you for getting in touch with EvelineCharles. Our microblading prices are available at our West Edmonton Mall, South Edmonton Common, Southcentre Mall and CORE locations. You most definitely use EvelineCharles Gift Cards towards your microblading services. Please call 780- 424-5666 or 403-571-5666 to book your initial consultation! Hi, is the promo still ongoing? I’m interested in getting microblading done. I see a lot of comments about a promo, is it still available? Is the promotion price in Edmonton available at this date? I’m interested in getting my eyebrows done. Do you have any pictures of the work that has been done? Thank you for getting in touch with EvelineCharles. Our microblading photos are on our Facebook and Instagram pages as well as our website. Microblading is available at our West Edmonton Mall, South Edmonton Common, Southcentre Mall and CORE locations. I have a question about the colour pigment/ink and numbing cream. Will there be any chance that an individual might be allergic to them? Do you guys set an appointment beforehand to see if an individual might have an allergic skin reaction? Thank you for getting in touch with EvelineCharles. We can do a consultation with you that suits your specific needs, and if you would like a test patch done to make sure there are no allergic reactions we can certainly do that. For more information and to book a consultation with one of our estheticians, please call us at 780-424-5666 or 403-571-5666. Hello, in the photo above can you tell me which location this was done at and who the technician was. Thanks. I had my first session done in another province and the work was horrible. I need to do touch ups and do not want to go back to that salon as I feel they did not have much experience in it. Would it be possible to get a consult and touch up with you and what would the price range be? Thank you for reaching out to us. You can certainly get a consultation and a touch up from any of our microblading technicians. Our touch up price is $175, to book your consultation please call 780.424.5666 today. I had my eyebrows microbladed at the southcenter location. I’m very unhappy, they both look different in shape and size. What can the team to to fix this? I paid 450+ to look insecure….. Thank you reaching out to us. The Microblading Procedure is a 2 step process & we the first touch up is necessary in order to achieve the desired look. The first couple days after the initial appointment, the pigment does sit on top of the skin making the brows appear larger and darker. It is a normal for the brows to feel larger or slightly red, once the skin heals and proper care is given, your brows will lose some of the pigment and then you will come in for your first touch up. Please give us a call if you have any other further questions and we can consult you on what to expect upon your first touch up 1-403-571-5666.
hey i was just wondering if there is before and after shots of the micro blading? Yes, you can have microblading to correct uneven brows. Please call our call centre to schedule an appointment at your EvelineCharles location of choice! Hi, do you still have the $450 price for micro blading eyebrows at Southgate Mall or South Edmonton Common? The cost for microblading at our South Edmonton Common location is $550, which includes your first touch up. Please call 780-424-5666 to book in.